Postmodernism had a multi-everything-anything-goes character. Post-postmodernism seeks to temper reason with beliefs which may, or may not, be religious. According to the Wikipedia entry on post-postmodernism 'a common positive theme of current attempts to attempts to define post-postmodernism is that faith, trust, dialogue, performance and sincerity can work to transcend postmodern irony'. The set of beliefs most likely to temper the raw postmodernism of landscape urbanism relate to sustainability, biodiversity, ecology and the green movement. Since the first Earth Day (April 22, 1970) there has been a growing belief that the earth is being wrecked, resources are being exhausted, biodiversity reduced and the sustainability of our species diminished. A book on Ecological Urbanism (by Mohsen Mostafavi and Gareth Doherty, Harvard University Graduate School of Design) was published in 2010. The publishers blurb explains that 'While climate change, sustainable architecture, and green technologies have become increasingly topical, issues surrounding the sustainability of the city are much less developed. The premise of the book is that an ecological approach is urgently needed both as a remedial device for the contemporary city and as an organizing principle for new cities. Ecological Urbanism approaches the city without any one set of instruments and with a world view that is fluid in scale and disciplinary approach. Design provides the synthetic key to connect ecology with an urbanism that is not in contradiction with its environment. The book brings together design practitioners and theorists, economists, engineers, artists, policy makers, environmental scientists, and public health specialists, with the goal of reaching a more robust understanding of ecological urbanism and what it might be in the future.' In a similar vein, the HSGD explains that 'Ecological Urbanism considers the city with multiple instruments and with a worldview that is fluid in scale and disciplinary focus. Design provides the synthetic key to connect ecology with an urbanism that is not in contradiction with its environment. The promise is nothing short of a new ethics and aesthetics of the urban.' These are not religious statements but they are statements of belief - and I recommend the term Landscape ecological urbanism, to integrate the geographer's and the designer's uses of the word 'landscape'. Nor should ecology be separated from hydrology, geology and many other ologies. One problem with beliefs is that they do not and cannot stand alone. Beliefs about how to treat the environment are bound up with beliefs about how to treat fellow-humans. Should elephants be used to supply meat to hungry Africans and medicines to East Asia - or should they be a speciies protected by international law? There is also a problem with belief systems. They take a very long time to develop and they benefit from being subject to the empirical and rational challenges of very long periods of time. They can evolve, slowly, but attempts at drastic change, and wholly new belief systems have not prospered, though some, like the Ethical Church, have survived The main world faiths have all developed environmental strands, as outlined in the Wiki article on Religion and environmentalism. One of my parents came from a reported seven generations of agnostics and the other from a devout Christian family. This gave me a sceptical attitude to beliefs and to a college course in the philosophy of religion. Buddhist ideas which appealed to me then and my interest in them was revived when writing a book on Asian gardens many decades later. 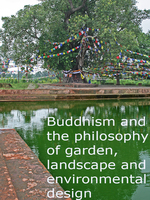 Practical involvement with a Buddhist garden, explained in the below video, developed this interest and led to an eBook on Environmental Buddhism. The Buddha was not a god and classical Buddhism is more accurately described as a belief system, or a philosophical system, than as a religious faith. Its founder welcomed challenges and saw endless change as a fundamental characteristic of the universe. As a founding principle, this has given Buddhism an open-source character. Everyone can 'contribute their own code' and take the beliefs in new directions. This made it easy for Environmental Buddhism to flourish, as has a philosophical kinship with systems theory (see Wiki Systems theory). More on Buddhism and environmental ethics. The title Ecological Urbanism (by Mohsen Mostafavi, Gareth Doherty, Harvard University Graduate School of Design) risks making the subject appear more technocratic than cultural. The principles of Landscape and Ecological Urbanism have a kinship to those of green environmental Eco-Buddhism.